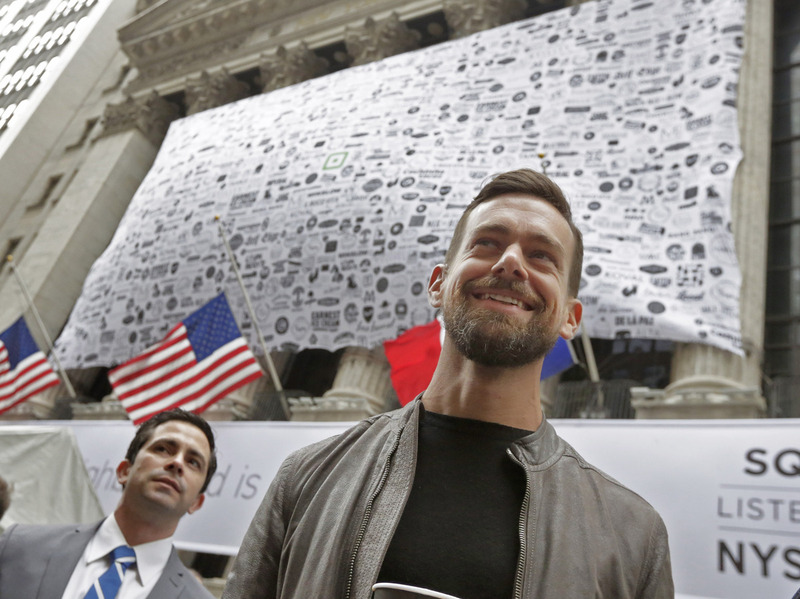 Do Underwhelming Square, Match IPOs Mean Bubble Trouble? : All Tech Considered Online payment startup Square and online dating giant Match have gone public. Their lackluster prices are the latest sign of Wall Street growing weary of tech hype and multibillion-dollar "unicorns." Square CEO Jack Dorsey outside the New York Stock Exchange before his company went public on Thursday. And Match set its initial price at $12, which was on the low end of the company's original expectations. This could be significant for how we, and the Wall Street, are thinking about Silicon Valley. But before we get into why, let's take a look at each company separately. And so Wall Street's clamming up. In 2012, Smith says, a company like Match would have sold for a lot more because back then, investors had an appetite and a tolerance for risk. "That tolerance is no longer in this market that we're in today," she says. Smith says Match's decision to price at the bottom of its originally planned range of $12-$14 signals a power shift. "It's the IPO investor that's calling the shots here," she says. Now, let's turn to the second company that hit Wall Street on Thursday, Square. "Square had this very unique proposition of allowing anybody to accept credit cards," says Gil Luria, analyst with Wedbush Securities, who recalls Square's glory days: "It was a very novel idea." That story has now flipped. As Luria puts it: "It's gotten a lot more complicated." Which is to say, Square has yet to turn a profit, the market is saturated and there's new, better competition. And from one perspective, you could look at Thursday's initial trading and say Square is killing it. Sure, it priced at $9, but at its peak the stock soared almost two-thirds above the IPO price. (It closed at $13.07.) It's a pretty successful initial public offering. Luria doesn't buy it: "Square priced the IPO low, in order for the stock to pop on its first day of trading, to create a perception of a successful IPO." Perception is key. The prices of Square and Match can fluctuate, but those initial prices — those lackluster prices — they're kind of a cold shower for Silicon Valley. With these companies' lackluster public offerings, there's a palpable shift in Silicon Valley. Local analyst Rajeev Chand, with Rutberg & Co., sums it up: "In today's market there is a bubble, clearly." It's actually a raging, unsettled debate. But Chand and other analysts say private investors have grossly inflated the value of their startups. According to CB Insights, more than 140 companies are so-called "unicorns," valued at more than $1 billion.